“It’s a nice day for a … black wedding?”. Yeah, black weddings are very Goth, no? Or ultra chic. Depending on how you look at it and feel about the subject. White weddings are all light and airy and sweetness and innocence whereas wearing black at a wedding is frowned upon. How did the colour black get such a bad rep? Poor thing. This post is a mock black wedding anyway. I only got a few shots off the black brides at the wedding photography workshop I attended recently. But first, a few behind-the-scene shots. 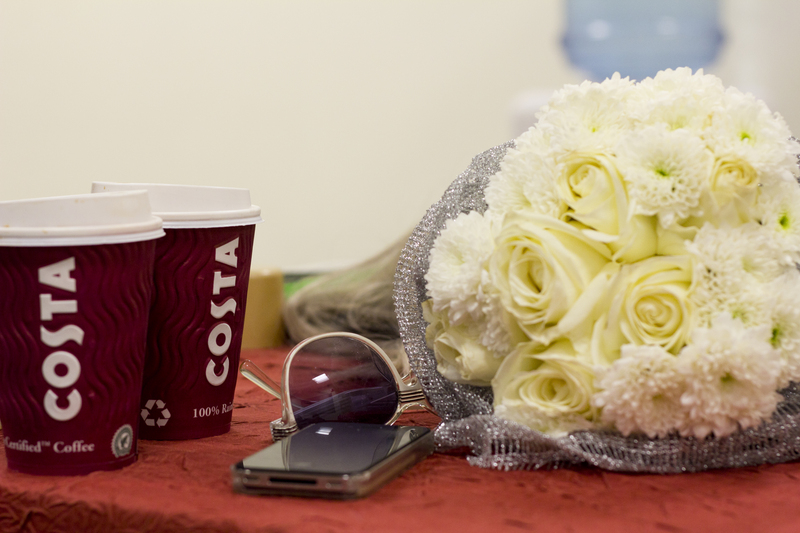 Bouquet, check. iPhone, sunnies, check. Coffeeeeeeee, check! Yeah, it was Ramadan when we had the workshop but since we were behind closed doors, food and drink were allowed. 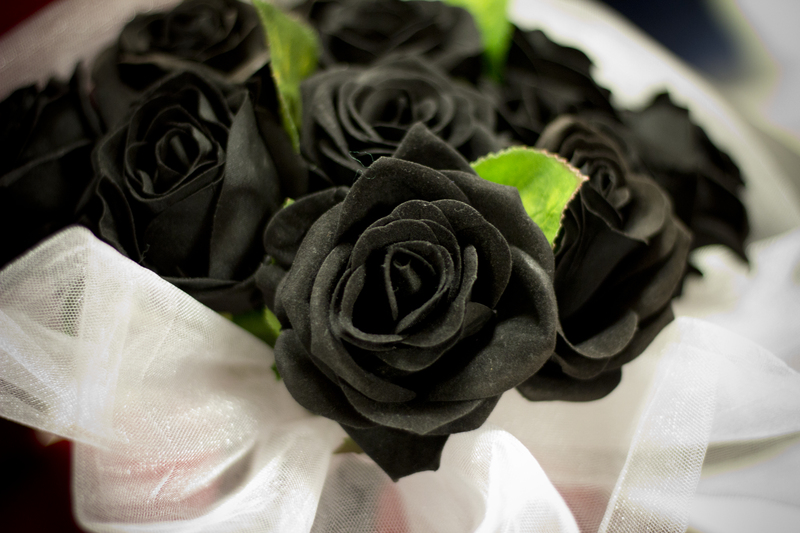 Ever seen a bouquet of black roses? Here’s one. Faux of course. I kinda like it. If I had my way I’d have this for my wedding. I’m sure every bride has a bit of the rebel in them wanting to do away with convention and tradition and just have fun on their special day. Brides are always more interesting to shoot than grooms. Sorry, guys. Here’s one of the very few I have with the groom, at a distance. Very informal, very …. boring. There was little elbow room at the scene so I took whatever shots I could. 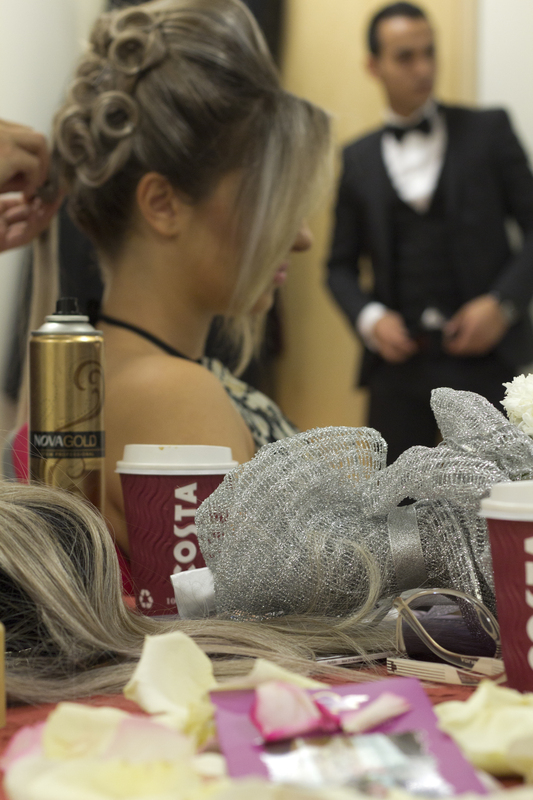 Here is Oxana, you will remember her as the bride in white from the previous post, getting all dolled up. I love that her eyes are closed here and her face is looking up. I only have two shots of the other black bride, Shona, this is one of them. She has the most amazing eyes and the make-up just made it perfect. This is the second photo of her. See what I mean about those eyes? Okay this is touched up on Photoshop with a few layers of blur and glow and diffusion. Karina was the other black bride. I was able to get some shots in when she was at the lobby of the Aviation College building where the workshop was held, and just enough before I had to leave. The black gown was quite striking, the skirt huge with its many layers and the top just a bit naughty with the see-through bones bodice. Karina carried it very well and she was a wonderful model. Playing up to the camera, serious one moment and playful the next. She didn’t mind adjusting her cleavage for maximum exposure either! It was a good intro into wedding photography, but of course the actual event will be even more rushed and frantic and crazy. I hope one day to be able to cover an entire wedding event. Maybe for one of my friends, just as a secondary option of course. I would be too nervous if the entire event depended on me. Wow, this is fantastic! It makes you want to get married all over again, beautiful shots Jocelyn! !